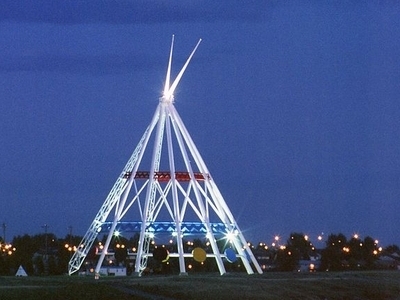 Just south of the Trans-Canada Highway and overlooking the Blackfoot buffalo jump is the world's tallest teepee, the "Saamis Teepee". 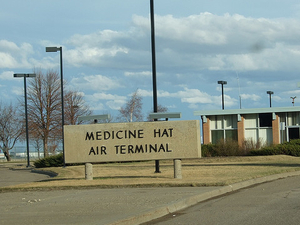 Designed for the 1988 Winter Olympics in Calgary as a symbol of Canada's Aboriginal heritage, it was moved to Medicine Hat in 1991. It stands over 20 stories high and was designed to withstand extreme temperatures and winds up to 240 km/h (150 mph). 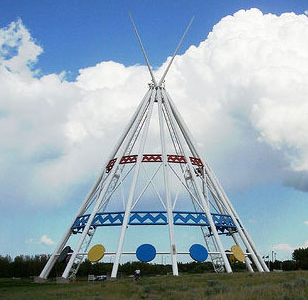 During a January 2007 windstorm, a portion of the teepee was damaged. Upon further inspection, it was discovered that extensive weathering was partially to blame. After repairs were complete, the Saamis Teepee now stands approximately 15 feet (4.6 m) shorter.